In 2015 I received an email from Karthikeyan Palaniswamy. 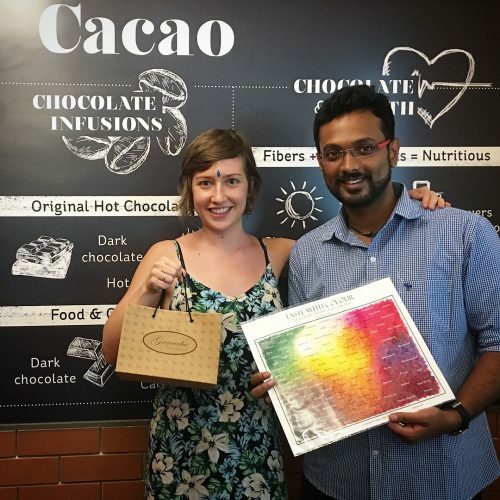 He asked if I would be interested in evaluating cacao and chocolate from his developing businesses (Soklet and Regal Cacao) based in Anamalai, Tamil Nadu, India. I was very excited to try cacao from an origin that I hadn’t experienced before. I jumped at the opportunity! I made a batch of Indian chocolate with Karthi’s beans. We exchanged bars (made with the same beans) at the Northwest Chocolate Festival 2015. They tasted quite different from one another. I remember tasting a Marmite flavour in my bar! A couple of years later we were reunited at Chocoa, Amsterdam in February 2017. Karthi and his business partner Harish Manoj (who manages the cacao farm) were exhibiting their cacao and new Tree to Bar chocolate brand Soklet. Mirzam also exhibited for the first time and had Indian bars for sale made with the same beans. At the event we discussed a visit to the farm. In October 2017 the trip came to fruition! The trip included Kathy and Obaid from Mirzam, Michael from Omnom, Greg from Dandelion, Sunita from The Chocolate Garage, Seneca from Lonohana and myself (thanks to Kathy for gathering the troops!). I started the trip in Kochi, Kerala with Michael. 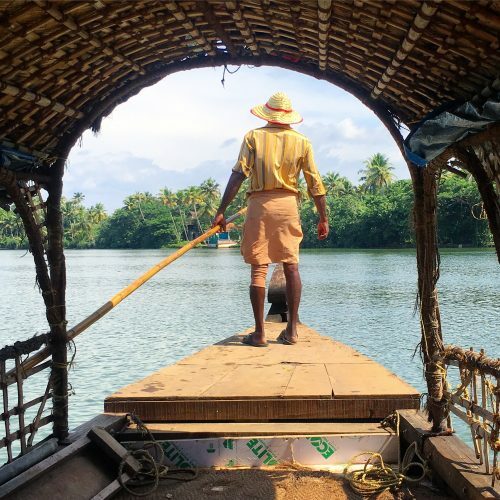 We did a couple of touristy activities together including a Southern Indian cookery class, Keralan backwater tour and an Ayurvedic massage (which was not what we expected… lots of oil and little clothing… I’ll leave it there!). I absolutely adore Southern Indian food. 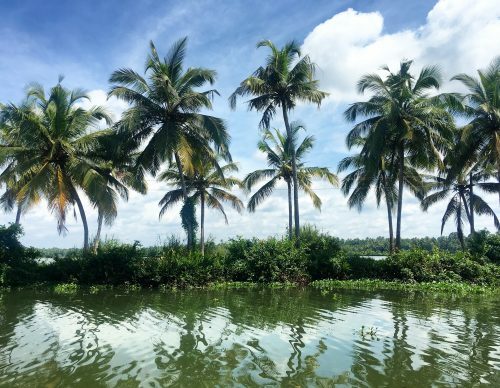 It was great fun to begin our trip with a few days immersing ourselves in the Southern Indian culture of Kerala. Before travelling up to Pollachi to visit Karthi and Harish Manoj, Michael and I visited GoGround Beans & Spices: a cocoa fermentary in Udumbanoor, Kerala. 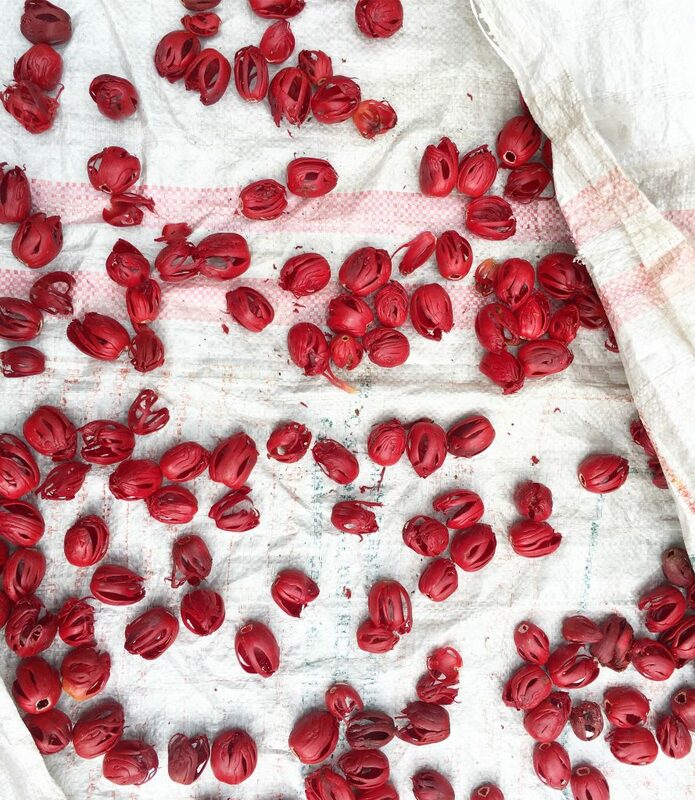 We toured their fermentation boxes and drying sheds and chatted about all things cocoa. Michael shared some chocolate that Omnom had made with their beans (that they shared at Chocoa – they were also exhibiting). 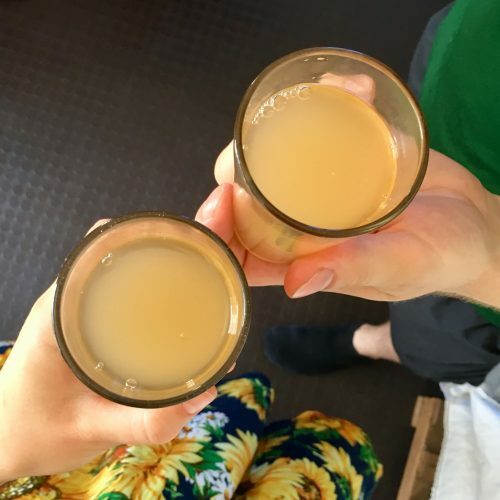 We also tasted some fresh cacao juice that they had been experimenting with! GoGround is run by expat couple Luca (from Italy) and Ellen (from Belgium). 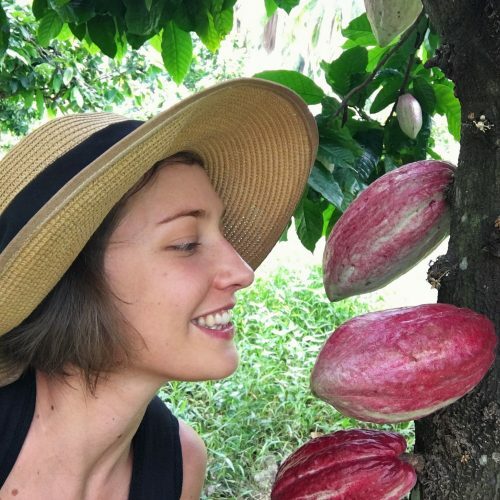 They source directly from around 200 farmers in the local areas (which is a luxury for the farmers – to have the cacao collected) and ferment in batches at their fermentary. Before GoGround existed, Mondelez used to collect the beans from the farmers. However, this was only during certain times of the year when they needed them. 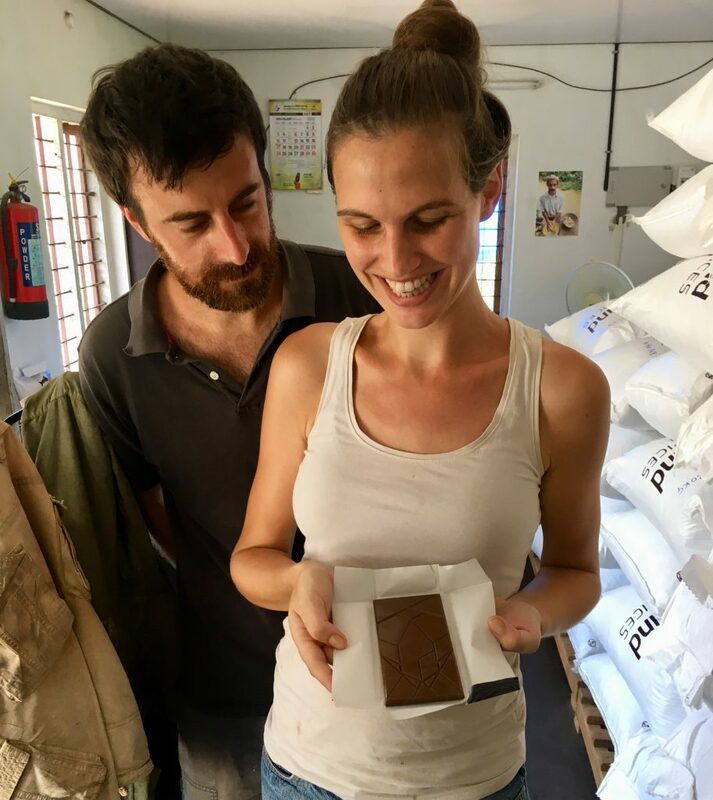 Over time, Luca and Ellen have developed relationships with the farmers and made long term commitments to suit both parties: the farmers commit to selling all of the cacao and GoGround commit to buying all of the cacao, not just at certain times of the year. This was the first fermentary I’d seen that didn’t use banana leaves. They only use jute bags to insulate the cacao during fermentation. Luca said that this is actually more common for fermentaries that do not have their own plantations. Luca and Ellen told us that they mainly hire women because they are more committed and trustworthy and have a great eye for detail. Women will also use the money for the whole family. At the time of our visit (October 2017) there were 4 ladies working but the number of staff depends on the season. 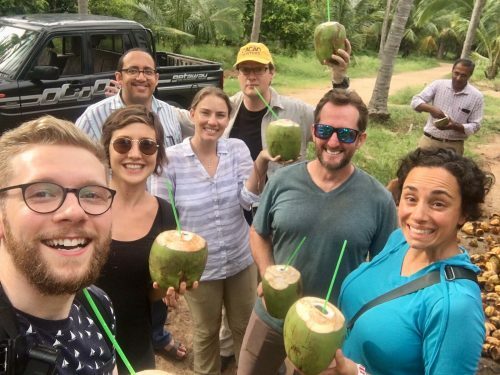 After visiting GoGround we travelled to Pollachi to meet up with the rest of the group and visit Karthi and Harish Manoj’s cacao and coconut farm. 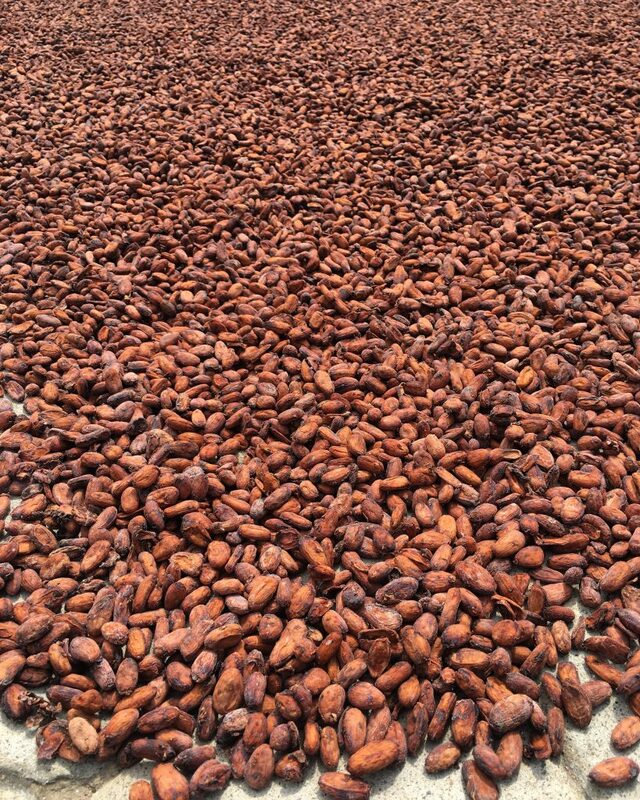 This was the most picturesque cocoa farm I have ever seen. 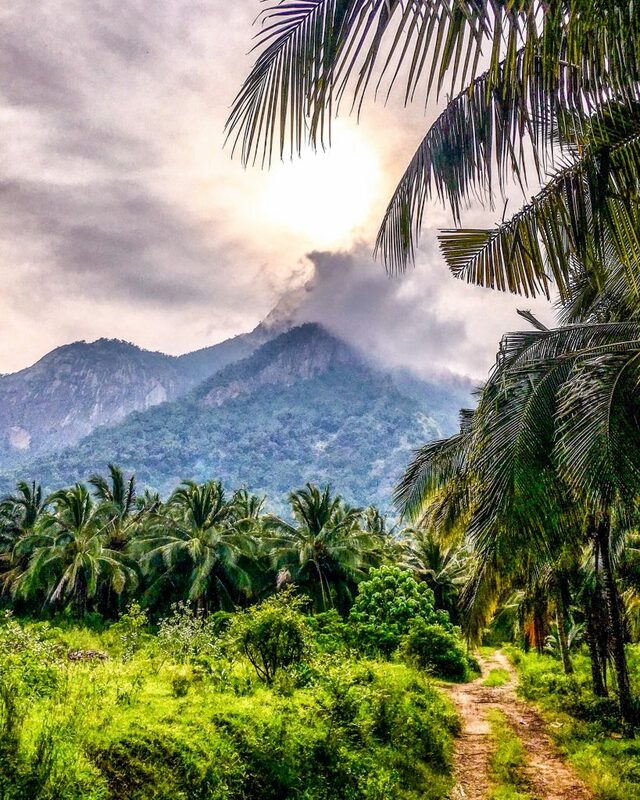 It has a higher canopy of coconut palms that shade a lower level of cacao trees with majestic Anamalai mountains in the background. The farm also produces nutmeg, jack fruit, cardamom and black pepper. 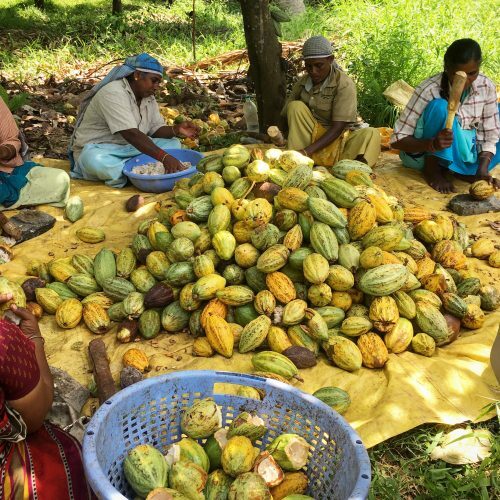 There are 4 farms in total which contribute to Regal Cacao, the name under which Karthi and Harish Manoj trade their cacao. The farms are all very large compared with other areas of India. The first one we visited had 2500 trees on about 15-20 hectares. The other three farms have 2000 trees each. The cocoa farms in Kerala, the neighbouring state, are typically 2-5 acres in size. Karthi and Harish Manoj follow a holistic approach to their farming. The farms used to be chemically treated and they worked hard on treating top soil to make it chemical-free. Now the farms are self-sustainable and they have reduced the import of chemicals by 90%. They have also optimised the enzymes and microbe content in the soil to further increase productivity and sustainability. Excited to meet Indian cacao in person! Happy in my natural habitat! Thanks to Kathy for capturing this. 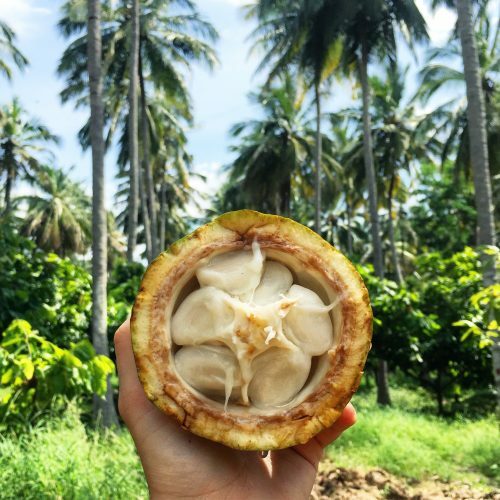 The intercropping of coconut with the cacao provides protection for the cacao trees from the harsh Indian sun. There are no full sun cacao farms in India because the trees would not last very long. Cacao needs some shade and coconut makes the perfect shading companion! Coconut is a household staple in Southern Indian cuisine (as I learned in the cookery course I took in Kerala) so Southern India grows a huge amount of coconut. Karthi and Harish Manoj are excited to make coconut milk bars using their own coconuts one day! 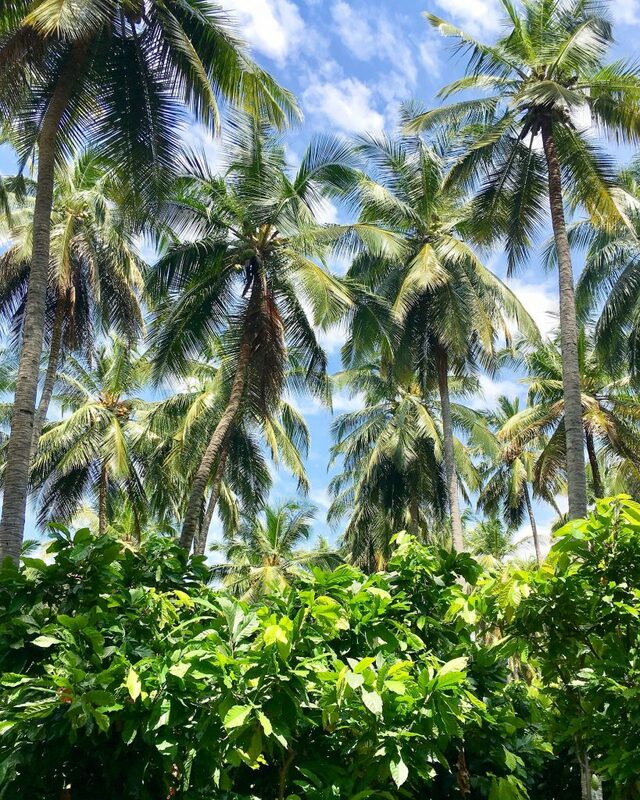 For now, they use the coconuts to produce coconut oil. 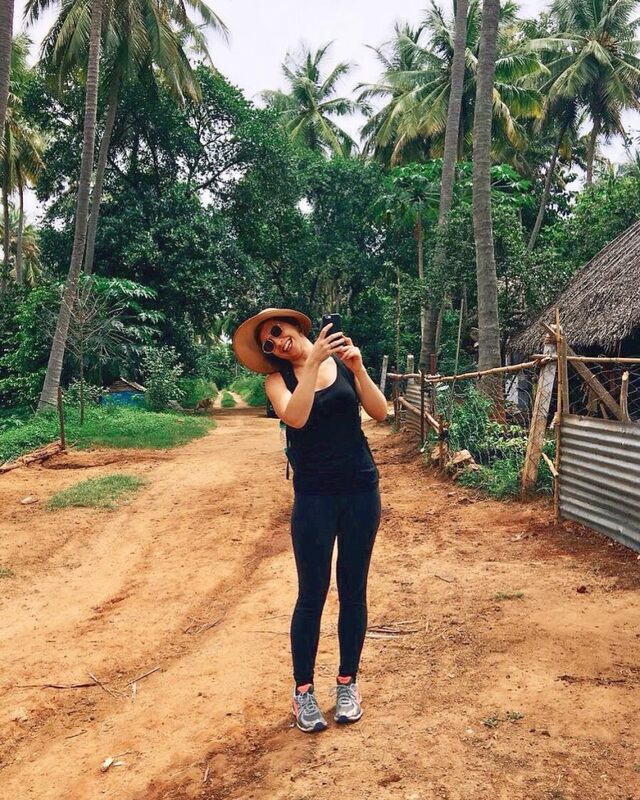 We wandered around the farm awing at the beautiful scenery, taking pictures and videos, drinking fresh coconut water and singing songs while Karthi and Harish Manoj shared stories and details of their farming practices. Sunita caught a few moments of our singing on camera, thank you Sunita :). We were fortunate to visit the farm during peak harvest season (October). We got to see the local Indian women harvest the pods with the “impact method” – whacking the pods with a stick so that they would crack open on impact to extract the pulpy beans, rather than use a machete. This seems safer than using a machete and also lowers the risk of damaging the beans. 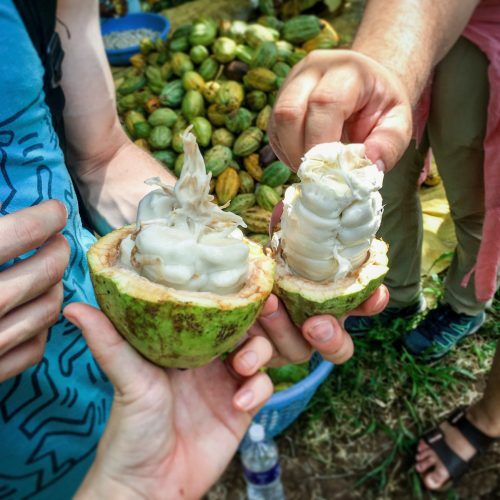 Of course we had a little taste of the fresh cacao straight from a freshly cracked pod. It’s so delicious! For anyone that hasn’t tried fresh cacao pulp, it tastes sweet and sour. The flavours vary from apply to lychee to mango and beyond, depending on variety (and many other factors). The pods are cracked at the farm so that the beans can pick up microbes from the farm’s surroundings for fermentation. 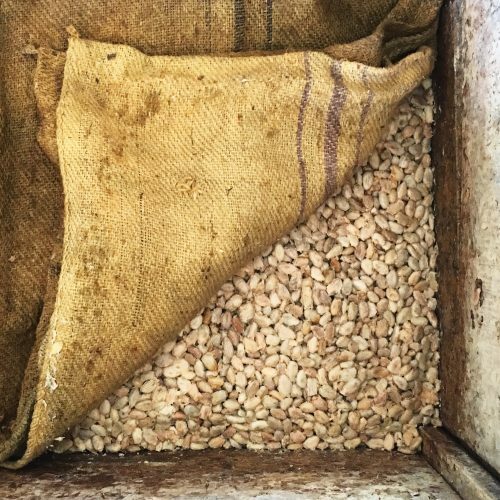 The beans are then taken a short drive away where the fermentation and drying processes take place. The conditions at the farm are ideal for growing cacao but the fermentation and drying processes require drier conditions. The beans are only out of the pods for a few hours before fermentation begins. 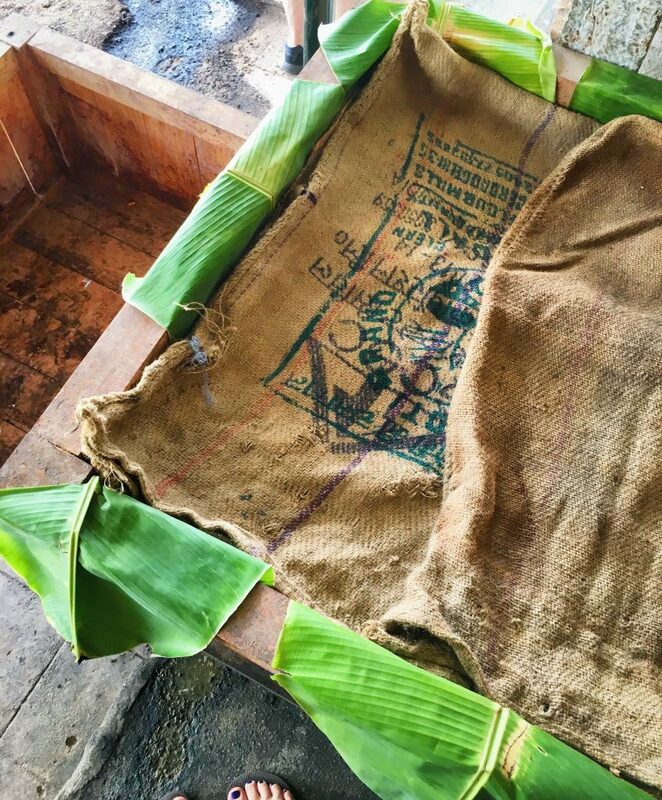 Karthi and Harish Manoj use banana leaves on the top and sides of their fermentation boxes (as well as jute bags on top) to enhance insulation. They have 4 boxes which are staggered. They ferment the cacao for 2 days in the first box, then 1 day each in the following boxes. This makes a total of 5 days fermentation. We had some interesting discussions about the inoculation of the cacao with yeasts and microbes. Some people say that the yeasts and microbes come from hands touching the beans, others say they come from the midges and flies that swarm around the fresh, pulpy beans. Once the fermentation has completed, the beans are dried gradually by laying them out in the sun for a few hours each day over a few days. 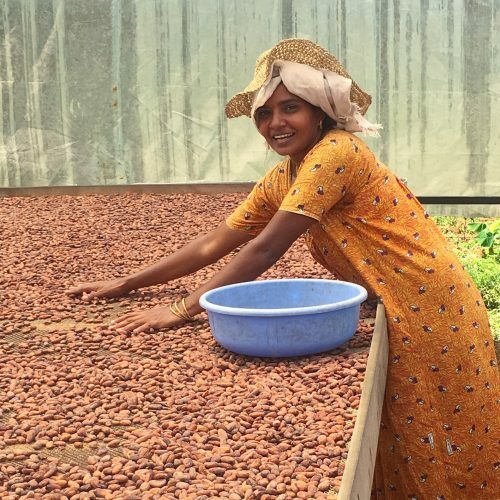 Karthi and Harish Manoj are not just cocoa farmers, they are also chocolate makers! 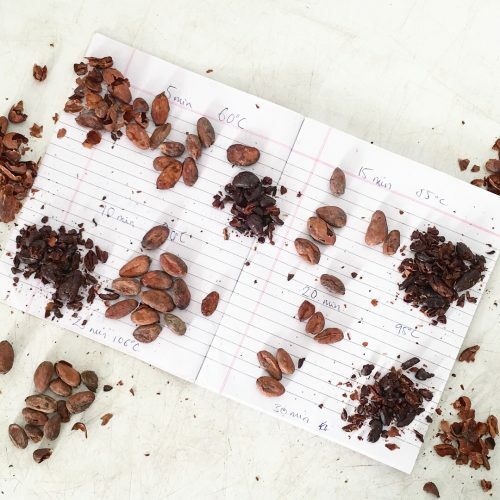 Since they grow the cacao and make chocolate from the same beans, in the craft chocolate industry we use the term “Tree to Bar” chocolate makers instead of “Bean to Bar” chocolate makers. The chocolate factory is situated in the back garden of Harish Manoj’s mother’s house. They roast the cacao in an Indian drum roaster that is traditionally used for nuts, spices and lentils. We carried out a test roast together using their usual roasting method (which meant roasting their standard 22kg batch!) to identify the optimal roasting profile. The grinders, cocoa butter presses and tempering machines were in separate, air-conditioned rooms. Karthi and Harish Manoj shared some truffles and fruit and nut clusters that they had made with their chocolate for us to take home, as well as a range of bars. We were totally spoiled with so much delicious, home-cooked Southern Indian food throughout our visit. I couldn’t get enough! We had a mass chocolate tasting after dinner one evening. The tasting included chocolate bars from all corners of the globe. The stash included bars made from Indian beans from 5 different chocolate makers: Mirzam, Arete, Omnom, Soklet and me! 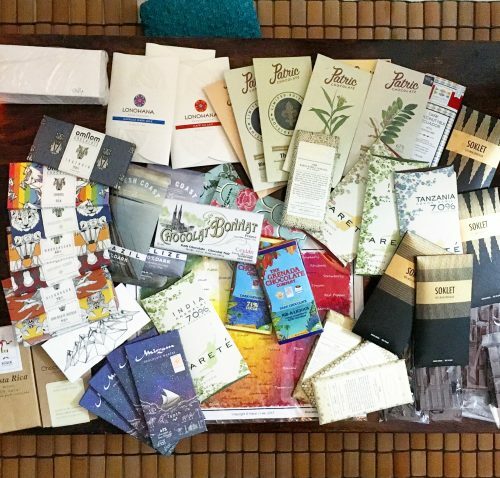 Chocolate Tasting including Indian bars made by 5 different makers, including me! Coincidentally, my first Taste With Colour® customer from India lives in Coimbatore—the same city as Karthi! So I arranged one last chocolate stop before my flight home. Arun Viswanathan and I share the same age and the same degree (BSc Food Science) and, of course, we share a huge passion for chocolate. Arun has worked as a chocolatier with his own company, Infusions – Chocolate Redefined, from a young age. At the time of my visit, Arun was about to open his brand new chocolate shop situated just outside of his family home. We had a chocolate tasting using Taste With Colour® with Arun’s mother Chitra, who is sadly no longer with us. 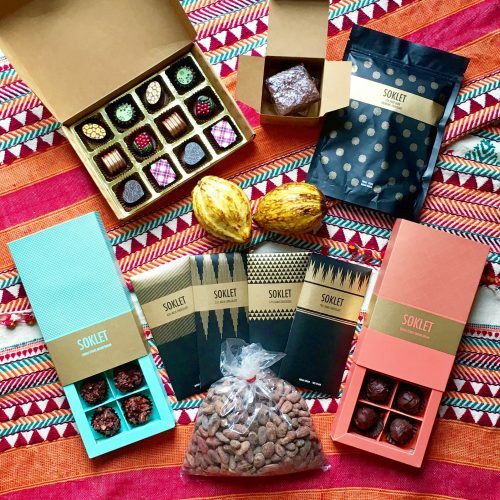 Arun has named his new craft chocolate business after his mother: Chitra’m Craft Chocolates. 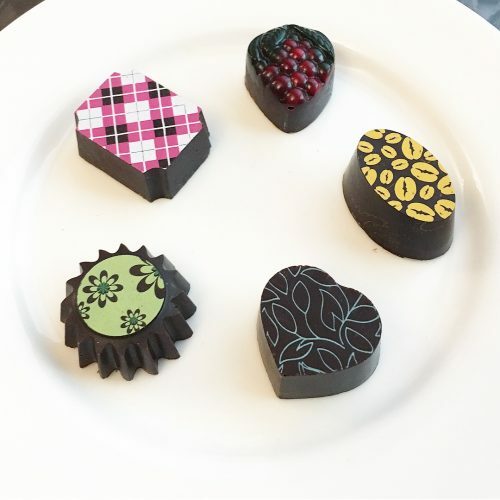 We tasted a selection of chocolates from Arun’s Infusions brand. We had some very interesting discussions about Indian chocolate consumers. 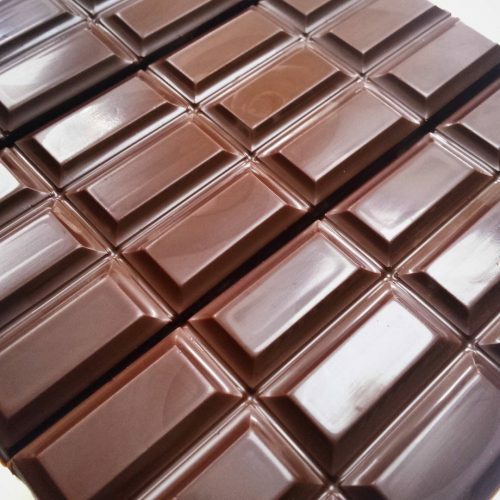 Initially Arun started off using a 55% dark chocolate couverture for his chocolates. However, consumers complained that the chocolate was too bitter! So he took it down to a 45% dark chocolate (Indians generally have a very sweet tooth!). It was also very interesting that the shells for all of the filled chocolates were extremely thick with a small amount of filling. It turns out that consumers also complained about thinner shells because they felt that they weren’t getting their money’s worth! Despite the thicker shells, I could still taste and appreciate the delicate flavour craftsmanship in the chocolate fillings. The Rose Lassi which was made from a honey-rose preserve was my favourite. It gave a lassi-like aroma with gentle flavours of both rose and honey. I find that honey pairs well with floral flavours. It really helps create a more rounded and fruitier flavour than soapy, which I’ve often found in floral-flavoured chocolates. Indian cacao goodies laid on my new Indian tribal scarf! I came home with a delicious stash of Tree To Bar chocolate bars, hot chocolate, truffles and clusters from Soklet, a box of Indian-inspired infused chocolates and brownies by Infusions, two baby cacao pods from the Anamalai farm, cacao beans from both Anamalai and GoGround and, last but not least, a gorgeous Indian tribal scarf (I also have a thing for tribal textiles – thank you Arun for taking me to this beautiful shop!). This jam-packed week-long trip far exceeded my expectations and stole a piece of my heart. However, it also challenged me to think about my position in the craft chocolate industry and where I see myself going. As Sunita said, “nothing like a trip to India to shake your life up!”. I hear that your late twenties can be uncomfortable as you figure out who you are and what you want to do with your life. I certainly felt a lot of that during this trip! As I landed back on British soil, I couldn’t shake off these thoughts and feelings. I had to explore them further. 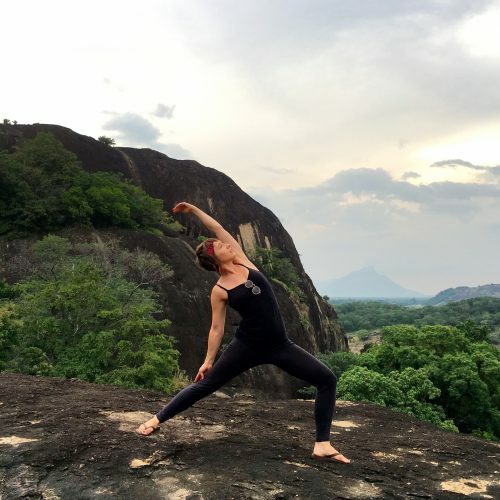 In February 2018, I decided to go back to India to carry out a Yoga Teacher Training in Goa. I have practised yoga for a number of years for both my physical and mental health. Following this trip in October 2017, it felt like the right time to dive deeper into my yoga journey and India was the only place to do it! 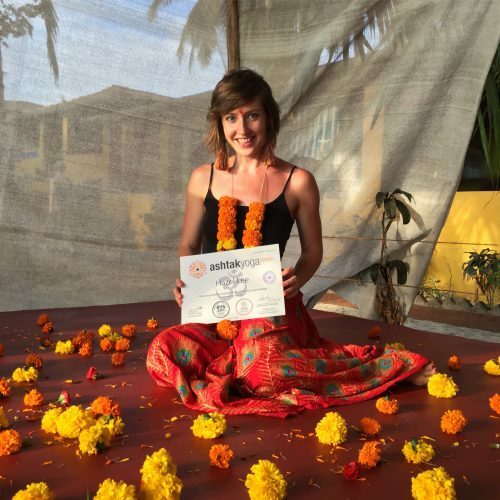 The day I became a certified yoga teacher in Goa! What a wonderful account of your latest cacao adventure and looking forward to reading the next. you have wonderfully expressed indian cacao.